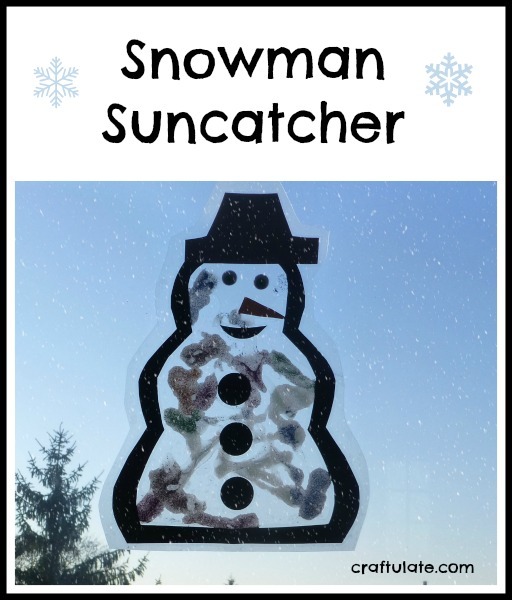 We made this fun snowman suncatcher craft when we had some friends over to play. 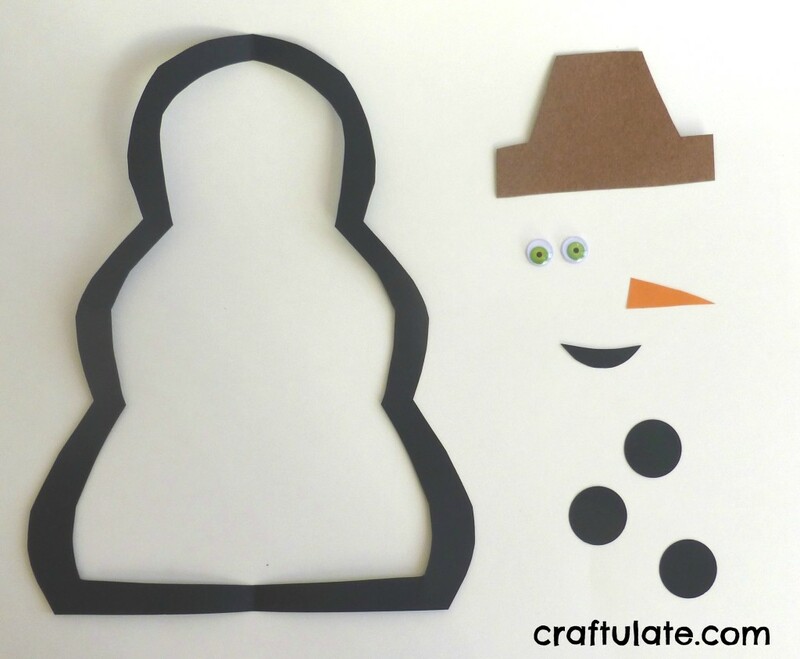 I based the idea on this turkey craft from No Time for Flashcards, but made the outline of a snowman instead. I used a piece of black cardstock for each snowman, folding it in half then cutting out a snowman outline. Then I cut inside the outline to make a frame. From the spare card I cut out some mouth shapes and used a paper punch to make some buttons. From some orange card I cut some carrot-shaped noses and from some brown construction paper I cut out some hats. 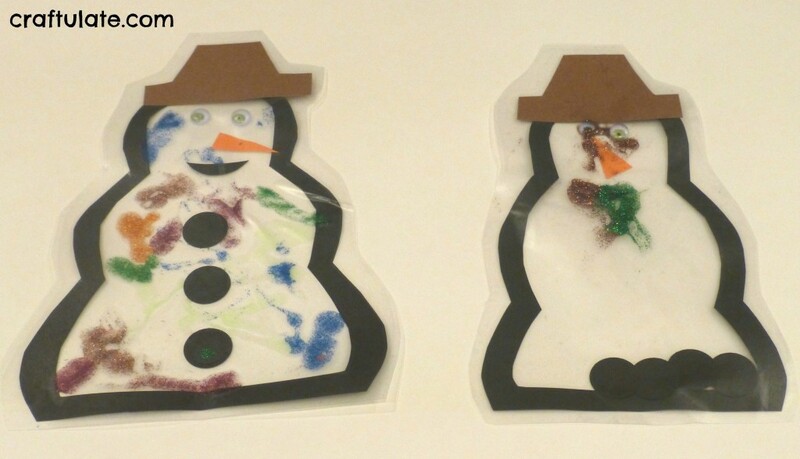 Just before we started the activity I laid each snowman outline onto a piece of contact paper, sticky side up. Then I provided all the cut out shapes, googly eyes and an assortment of glitter glue pens: rainbow pens and neon bottles: both types were sent to us by our friends at craftprojectideas.com. 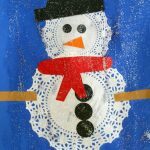 The children (F – 2.5yrs, Miss E – 5.5yrs, Miss L – 4 yrs) all started spreading the glitter glue inside the snowman outline, adding the features whenever they wanted to. 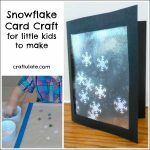 This is a great craft to do when you have friends visiting, as it can all be sealed up and nothing has to dry before they can take it home. Here is F’s snowman catching some rays! Your snowan turned out so cute! Great shot too. I really like how you incorporated the neon bottles and pens. Thank you for sharing on our FB page. Pinned. Such a fun activity! thank you for sharing! Cute! 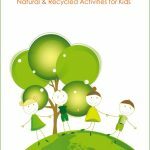 I’m highlighting you this week on Share it Saturday! Thanks for linking up! 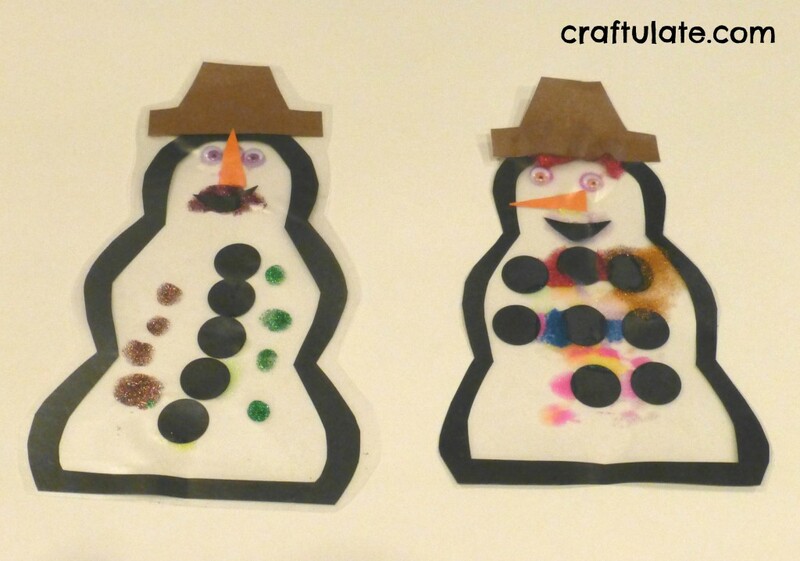 Pingback: Fun Snowman Crafts for Kids - Look! We're Learning!